A good breakfast is key to a good weekend for me. After trying out various options, we have figured out that Candies at Mc Ronnel is our favourite. I felt like something different last weekend. More like a hot breakfast. So we headed to Crepe Station at the Carter Road food lane. 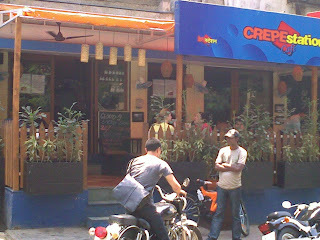 Crepe Station had first opened at Carter Road five years back. Kainaz and I went there once in its early days. I remember us going to the tiny sit in section upstairs where we tried out some sweet crepes. Crepes were fairly new to Bombay then. They are not too popular even now. Crepe Station soon moved on to waffles (Kainaz loves the Nutella waffles here), breakfast fares, continental lunches and even local dishes such as parathas and poha! Crepe Station grew in size, in range, in number of outlets and eventually shifted a couple of outlets down the road from its original place at Carter Road, Bandra. The new place at Bandra has a slightly bigger sit out. And, if you contort yourself, you can even get the odd glimpse of the sea in the morning. They have a small air conditioned section too. The place was reasonably crowded last Sunday morning. The crowd was typical Bandra - young couples, the odd family with kids, a few foreigners and a couple of grandmas. Service was sluggish. We waited for more than twenty minutes for our breakfast after placing the order(I came prepared and had a cookie at home), about ten minutes for some ice cubes which we wanted for or fruit juice and about seven minutes after they said that we will get our food in two minutes. We kept looking at the kitchen, saw people come out with an order and then lost hope as we reaslised that it was for someone else. The food came eventually. And it was absolutely worth the wait! 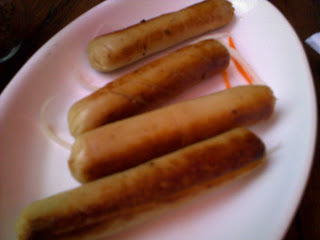 We had fried chicken sausages (Rs 90, 2 USD) which were fantastic. The sausages were juice, left a delightfully creamy after taste and were topped with cracked whole pepper which really livened them up. 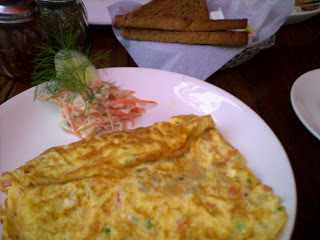 We also tried Spanish Omelets (Rs 160, 3 USD). This was a regular omelet lightly stuffed with bits of potato and olives. The omelets were fried just right. AND it had the right amount of salt. A lot of places, especially Just Around The Corner, serve unsalted omelets. The Spanish Omelet was served of crisp, ho,t brown bread and butter. The brown bread was surprisingly tasty. We also had a watermelon juice (Rs 40, 400 ml) and grape juice (Rs 25, 200 ml) which were fine. 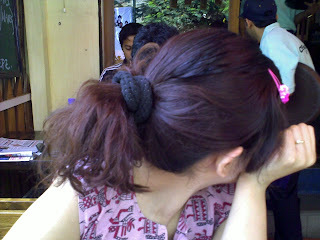 I quite enjoyed the breakfast and the open sit out (I was facing the restaurant front while K faced the dusty road). It is not a cheap option though as breakfast two, with dishes shared came to about Rs 350 (7 USD). Breakfast at Candies (two coffees with free petite fours and a sandwich) cost us about Rs 150 (3 USD). She was notably calm and quiet once the food arrived!